In the world of food there is this moment called plating. A pinnacle point. It is the culmination of all the stress and multi-tasking it takes to finish a culinary work of art. Watch any reality T.V. cooking show and you will see the chaos, the frazzle, that all leads up until that moment where the chef chooses the perfect plate to showcase their work of art. This juncture is what I want to dive into, the joining of ceramics and food. This image below is what this month's ceramic dish was designed for. 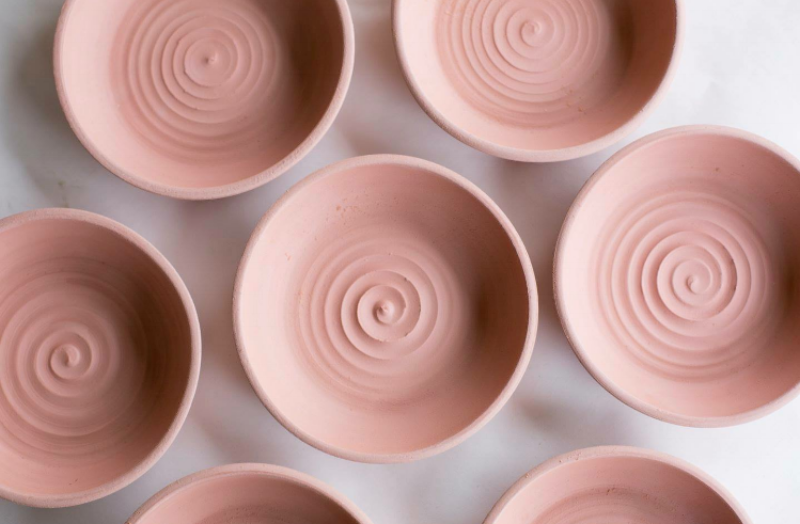 A fleeting moment that captures the intimate relationship ceramics has with food. Something that can be dated back to around 9000 or 10,000 BC. when the first functional pottery vessels were made and used for storing food and water. Ceramics of course has evolved from basic vessels into many different types of complicated glazed forms, and shapes throughout many different countries. Almost all of which have a deep history with food within their culture. South korea has Onnggi jars made to ferment kimchi, China hastea pots made from their signature white porcelain, and Africa has Tangines that they use for cooking stews. This is only scratching the surface of ceramic vessels throughout history that were made for food. Along with the history of ceramic vessels I thought it would be nice to give a brief history of fine dining. I came across a wonderful article in Bon Appetite that was super relevant, so I thought I could give a quick summary. Let's hop back a few years to France, and learn about where the phrase "plating" originated. The history of plating begins with a man named Marie-Antoine Careme who was born in 1784-1833. He was pretty much the first celebrity chef of his time. He used his love for architecture as inspiration for his pastry creations, and presented dishes in the shapes of famous monuments as you can see up above. He was even believed to invent the Croquembouche (which is something I having been wanting to make since I was little, so I was really excited to learn about this tidbit). Careme's grand food presentations were really only seen by the wealthy, and it wasn't until Auguste Escoffier (the man pictured below) came around that an appreciation for food presentation was introduced to the public. In Escoffier's time food was still mainly prepared in separate buildings over wood or charcoal stoves, and then carried to a dining hall where they would be served. He helped invent devices and methods to move the food preparation into the same building. Which eventually lead to smaller plates, and gave the diners the option to choose what they wanted off of a menu. Voila! fine dining was created. This was basically the catalyst, for not only the business of fine dining, but the transition into A Nouveille Cuisine. A modern style of cooking lead by a man named Fernand Point that avoids rich, heavy foods and emphasizes the freshness of the ingredients along with the presentation of the dishes. This way of cooking and serving has turned food into an art form. From there the creative works of chefs began to sculpt the way we eat, what we eat, and the plates we eat off of. Thanks to the culture shift of fine dining, both food and the plate it sits on can be considered pieces of art, and for a short period of time they compliment each other in the final presentation or plating. The art of food is ephemeral. It captures the eyes of hungry diners, but since it is meant to be consumed it only lasts in the few minutes it takes to be eaten. Ceramics on the other hand is one of the most lasting and permanent pieces of art someone can work with. It lasts long after the food is eaten and possibly past the life of the person who made it in the first place. I may sound like a hopeless romantic, but I consider the plating of food to be a wonderfully magical moment; when two entirely different pieces of art come together to shine at the same time. Completely different histories and lifespans, but in that moment they come together in some type of beautiful serendipity. This is why a basic understanding about the relationship between food and ceramics is so important. Having the foresight to know what the functional ceramic piece will be used for can not only help with the design, but it can also compliment the final plating. Park, Michael Y. "A History of How Food Is Plated, from Medieval Bread Bowls to Noma." Bon Appetit. Bon Appetit, 23 Feb. 2016. Web. 2 May 2017.